Mycotoxins are major food contaminants affecting global food security, especially in low and middle-income countries. The European Union (EU) funded project, MycoKey, focuses on “Integrated and innovative key actions for mycotoxin management in the food and feed chains” and the right to safe food through mycotoxin management strategies and regulation, which are fundamental to minimizing the unequal access to safe and sufficient food worldwide. 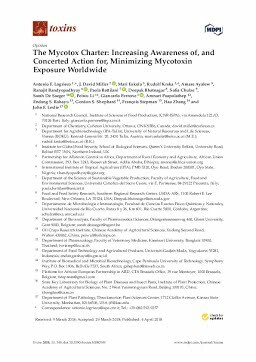 As part of the MycoKey project, a Mycotoxin Charter (charter.mycokey.eu) was launched to share the need for global harmonization of mycotoxin legislation and policies and to minimize human and animal exposure worldwide, with particular attention to less developed countries that lack effective legislation. This document is in response to a demand that has built through previous European Framework Projects—MycoGlobe and MycoRed—in the previous decade to control and reduce mycotoxin contamination worldwide. All suppliers, participants and beneficiaries of the food supply chain, for example, farmers, consumers, stakeholders, researchers, members of civil society and government and so forth, are invited to sign this charter and to support this initiative.